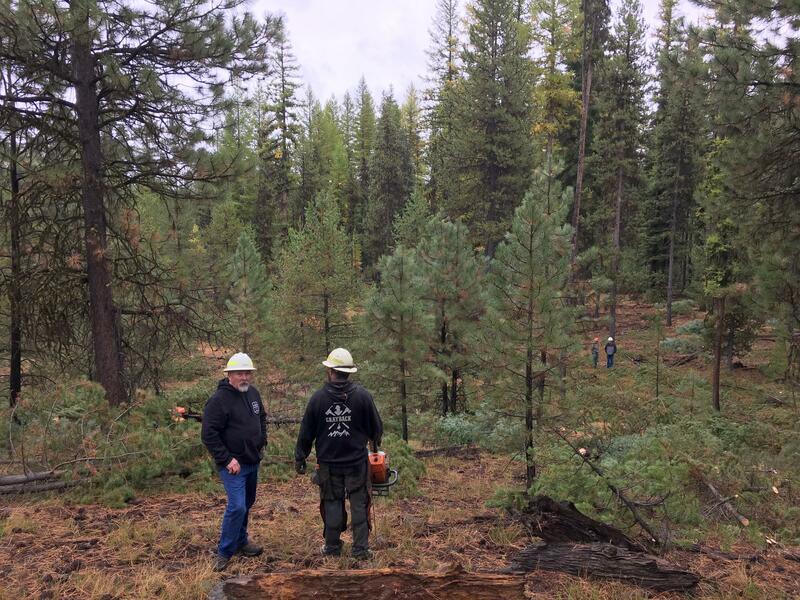 Grayback Forestry crew boss Bob Larkin at work on a thinning project in the Malheur National Forest. 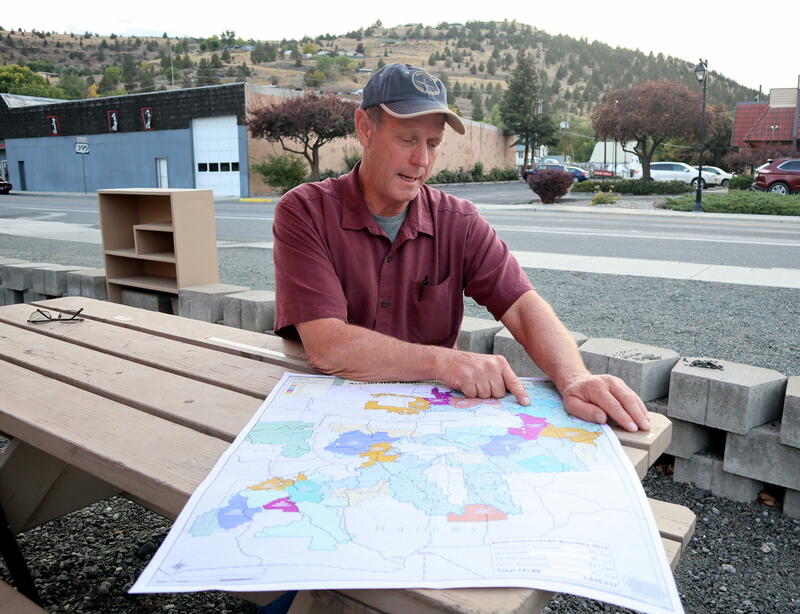 In a sparsely-populated stretch of eastern Oregon, this strategy has worked. The Malheur National Forest has managed to increase the pace of restoration without getting sued for more than a decade — which is saying something. Fifteen years ago, environmental lawsuits had shut down most logging in eastern Oregon's Blue Mountains. Then, as now, Dave Hannibal ran the John Day base for Grayback Forestry, a contract crew provider for firefighting, thinning and forest restoration. "Industry was at a standstill, the environmental community was not getting what they wanted, the forest is burning up," Hannibal said. "Companies like Grayback, we don't have enough work, right? There was not enough to be sustainable. So everybody was motivated to find a solution." The solution was to sit down together outside the courtroom and seek common ground. Portland-based environmental attorney Susan Jane Brown, who was filing a lot of those lawsuits on behalf of different advocacy groups, accepted an invitation to come to the table. Brown and Hannibal started working together along with other loggers, conservationists, mill managers and community members. In 2006, the collaboration became a formal organization, Blue Mountains Forest Partners. That's not to say it was easy. "The first probably two years were fairly rocky," Hannibal said. "There was quite of bit of disagreement," Brown, who now works for the Western Environmental Law Center, added. "In fact, most of the time everybody left those conversations very frustrated." Every national forest in the Pacific Northwest has now aligned with at least one outside "collaborative," as they are called. The idea is to build trust and get compromises done at the front end of proposed timber sales, thinnings or controlled burns. That way, the work doesn't get bogged down in litigation or analysis paralysis later. "The more time we spent together, the more we realized that there really was common ground," Brown said. "When we're out here in the woods, a lot of times we're not all that far apart in what everybody wants," Hannibal added. "When we're actually able to take away those hard positions people have and look at what we truly want left on the forest." Dave Hannibal and Bob Larkin discuss next steps on a Malheur National Forest thinning and restoration project. Hannibal said "three to four times the amount of work" is getting done nowadays compared to 15 years ago. Timber sales data from the Malheur National Forest tell a similar story. From 2010 to 2016, the volume of timber cut from the forest more than doubled. The collaboration and a 10-year stewardship contract gets credit for saving the last sawmill in Grant County, Oregon, too. In the hills south of Prairie City, decades of fire suppression have led to thick undergrowth beneath a canopy of widely spaced, older ponderosa pines and larch. But today, the forest is poised for change as it echoes with the sound of chainsaws. The Forest Service hired one of Hannibal's crews to thin this section of forest from its current 2,000 stems per acre to a more natural 100 to 200 trees per acre. Another team came along afterwards to make slash piles of the spindly saplings. The slash piles, which presently have no commercial value, will be burned next spring. "In the past, we would have had fire come through every seven to 15 years," said Sarah Bush, a forest fuels specialist for the Malheur National Forest. 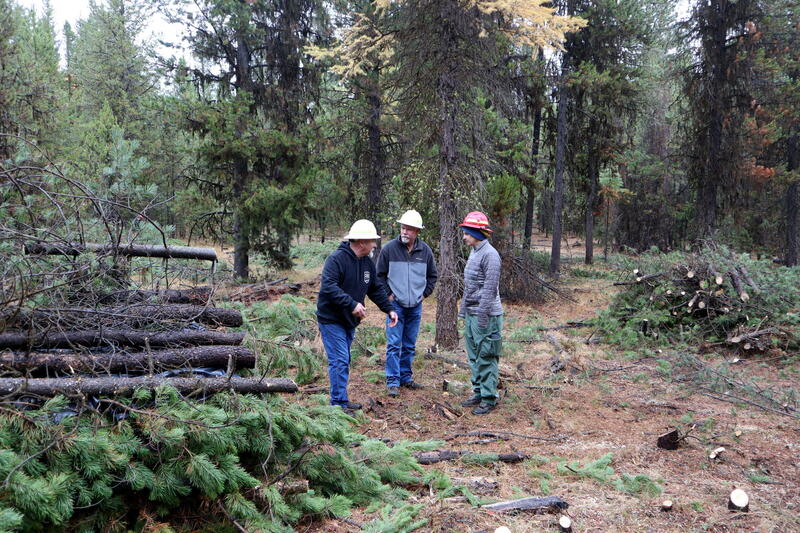 Dave Hannibal of Grayback Forestry, left, discusses the progress of a thinning project with Roy Walker and Susan Bush of the U.S. Forest Service. Roy Walker, the Malheur National Forest partnership coordinator, said progress on thinning creates the opportunity to increase the pace and scale of low-intensity controlled burns to help fix the 1.7 million acre forest. "We finally got ourselves us set up," he said. "Where in the past we would burn 100 acres at a time or 200 acres, we're getting a lot more opportunities now for 5,000 acre burn blocks, 1,000 acres. Finally, we're getting the fire back on the landscape and maybe opportunities to manage lightning fires in the summer." Collaboration has brought an era of legal peace to the Malheur forest, but that doesn't equate to lawsuit immunity. Some environmental and community groups have dropped out of the partnership and others chose to stay on the outside. Other national forests in the Northwest are still getting sued over logging plans. Oregon Wild dropped out of the Blue Mountains and Mt. Hood collaborative groups, but participates in four or five others to the extent the environmental group has the capacity to staff them. Oregon Wild has active lawsuits right now against the Mt. Hood National Forest and the Umpqua National Forest over different timber sales there. Brown, the attorney, said she sometimes get accused by fellow environmentalists of being a sellout or a shill for sitting down with the timber industry. She understands why, but rejects the labels. "We are mutually benefiting each other," she said. "If I want wildlife habitat and old growth forest in the future, I'm going to need the logger out there to get rid of the small grand fir to take it to the mill so the whole thing doesn't get consumed in fire, or lost to drought or insects and disease." A Forest Service directory lists 36 collaboratives associated with the 16 national forests in Oregon and Washington state. Some are more successful than others. Brown said the greater presence of endangered species west of the Cascades complicates the work of the groups active in wet-side forests. Regularly mentioned among the more successful collaboratives are community nonprofits associated with the Colville, Siuslaw, Deschutes and Gifford Pinchot national forests. Blue Mountains Forest Partners executive director Mark Webb said the Forest Service doesn't do everything the way the nonprofit collaborative recommends, but they have been willing to adapt. "In the past we needed a neutral, third party facilitator," Webb said in an interview in John Day. "It's no longer like that." Webb said the nonprofit roundtable he runs gets funding from the state of Oregon and private foundations. The Malheur National Forest got a separate federal grant to pay for extra planning positions and to subsidize thinning projects when there is no marketable timber involved. Today, Oregon's two U.S. senators want to increase federal funding for collaboratively-agreed forest restoration work.